A comment from a reader on my Friday post on robotics and automation got me thinking about long-term trends in average working hours. 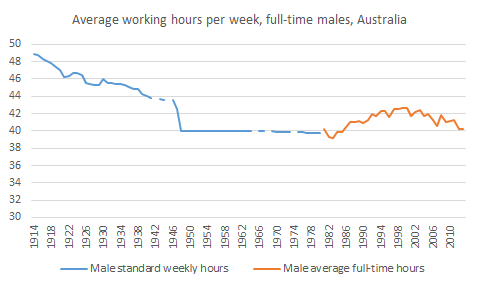 Historical data on standard male working hours (from Glenn Withers’s chapter in Vamplew’s Australians: Historical Statistics), which I’ve combined with recent ABS data, show a large drop in average hours worked in the last 100 years. While there was a period in the eighties and nineties when average full-time hours started to increase, this appears to have been unwound in the 2000s (see this ABS article on Trends in hours worked, which shows that average working hours across all workers have fallen over the last few decades as the proportion of people working part-time has increased). Partly the drop in average hours would have been driven by technological progress, which has improved productivity and incomes. As we became more productive, we bought ourselves more leisure time as well as additional goods and services. As robotics and automation become more prevalent, I expect we’ll be able to buy ourselves more leisure time, and average hours will continue to fall, as more people can then afford to work fewer hours. Of course, with improving communications technology, including video calls, we can probably expect more work-related interruptions at home. The blurring of work and personal lives will continue to be a major issue in workplace and business relations. N.B. Comparable historical figures back to 1914 for women don’t appear to exist, but I expect the average hours trend has been similar for women working full-time. Of course, the major labour market trend for women over the last 100 years has been rising participation in the workforce due to social and economic factors – a trend which I’ll aim to discuss in a future post. This entry was posted in Labour market, Uncategorized and tagged abs, australia, automation, robotics, workinghours. Bookmark the permalink. As the population ages, hours of work can reduce for many reasons. People in their 50s and 60s reduce hours if they choose and in financial position to do so. With baby boomers reaching retirement but super having taken a hit during GFC some choose reduced hours over early retirement for stability. Interesting if population demographics are considered? Yes, we’ll certainly see a higher proportion of part-time employment and possibly further reductions in average working hours as the baby boomers transition to retirement. Thanks for the comment, Kylie. I cannot see that the reduced working hours have converted into leisure time. More likely this increased productivity has been wasted in increased time spent in commuting, and waiting longer in traffic, and commuting longer distances. Possibly in recent decades. But 100 years ago many people walked or rode a bike to work, often relatively long distances, so I’m unsure whether on average we’re spending more time traveling to and from work. Hi Gene. Thanks for looking into this. However, I’m not sure your chart really supports your comments. Based on the chart, it would appear that the entire decline in hours worked for full-time male employees occurred before 1950, before the information age. Also, I’m not sure the time series is comparing like with like, as standard hours and average hours are different things. Yes, Paul, you’re right it occurred before the information age. I’ve been trying to make a point about the impact of technological advances in general, rather than just recent ICT advances. While very important and productivity enhancing, recent advances may have had an questionable effect on our work-life balance as you’ve previous commented. I do expect improving robotics and automation to have a big impact on productivity and ultimately, possibly some decades in the future, to lead to greater leisure time. I agree it’s reasonable to say there’s been no overall trend since the late 1970s. It’s possible that around 40 hours per week is broadly acceptable as a standard working week.